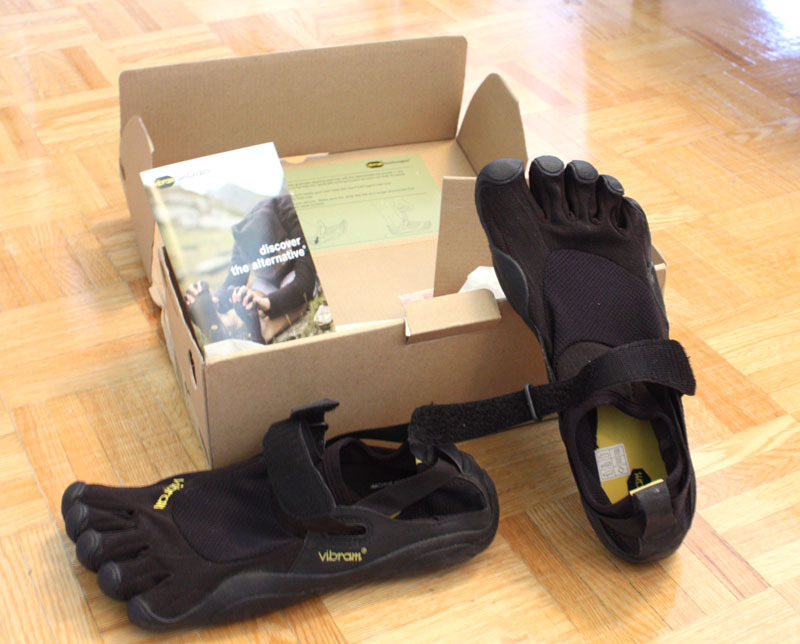 I’ve heard wonderful things coming from all over the web-o-sphere about Vibram “FiveFingers” and decided to give them a shot. I recall first hearing about them on Reddit.com where someone had posted an article making a compelling case for barefoot running versus running shoe.. running. A fellow Redditor pointed out the study was partly funded by Vibram, potentially making it a slightly biased study, but nevertheless the article made some interesting claims and pushed me into further investigation into this odd foot wear. Calling the product “foot wear” almost defeats the purpose of Five Fingers, which are, perhaps, best described as gloves for your feet. 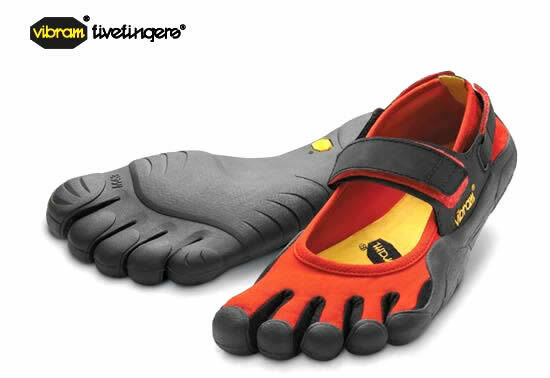 The whole philosophy behind FiveFingers come from the notion that the modern running shoe has set back millions of years of podiatric(foot) evolution. Leonardo Di Vinci has been quoted as saying “The human foot is a masterpiece of engineering and a work of art.” and for the most part this is quite true. Vibram notes on their website that our feet have as many as 26 bones, 20 muscles, 33 joints, as well as a multitude of sensory receptors, tendons and ligaments that the modern shoe just doesn’t make use of. As a result, many of our feet, since childhood, have been set in a sad state of atrophy. When we walk in our modern day shoes we feel very little, move our feet very little, and have been conditioned, for the most part, to step heel toe. 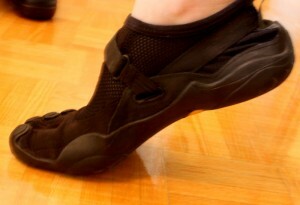 The modern shoe has been developed over the years to encourage this type of “heel toe” step. However, in recent years studies have been conducted to discern whether or not this type of running and walking is ideal for our feet. Further studies are obviously needed, and I’m no scientist, but as I understand it, findings have been showing that landing on your heel puts a lot of high impact stress on your legs and joints which can result in problems and injury later down the figurative road. Barefoot running has been said to improve all kinds of natural aspects of your foot such as the range of motion in your feet’s joints (toes, ankles, etc. ), muscle strength in your calves, feet, and lower legs, balance, agility, proprioception, body awareness, and posture among other things. So, in short, barefoot running seems pretty darn swell. Many of you who know me personally, know that I’ve been an avid martial artist for several years now, of which involves training in bare feet. In high school I spent a lot of time in track and field training, and although I never became an Olympic runner or professional athlete, running and jogging has always been an important part of my daily regimen. I also find the notion of “natural remedies” and “natural” products to be intriguing. So, suffice it to say, all this talk about the Vibram barefoot advantage, has piqued my interest in the last few months. I noticed FiveFingers were out of stock, via the official website, for several months. Only one store in Toronto (MEC on King st.) currently sells them, and they’re consistently out of stock as well. One can only assume Vibrams have become a hot commodity so I jumped at the chance a few weeks ago to order a pair when I noticed they were finally in stock. Choosing your Vibram model can be a daunting task. 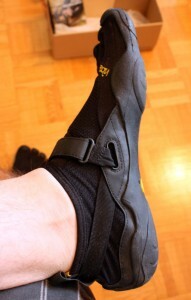 Vibrams come in all types and flavours and I opted for the popular KSO line. KSO is short for “keep stuff out” since the shoe has a top covering lacking in the other models that.. well.. keeps stuff out! KSO’s are also marketed to be useful in all types of terrain and activity due to their, tougher than average, design. I naturally chose black because it was the least ugly of all the colours and styles. 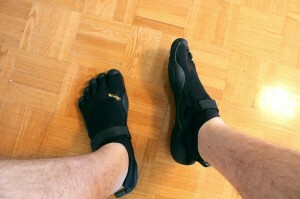 I had been warned to be prepared to get funny looks from people, as FiveFingers do not look in any way like your average footwear. My coworker had even told me they looked creepy upon viewing the website photos. I don’t know if I’d go as far as calling them creepy, but they certainly look odd I suppose. My KSOs finally arrived on a sunny Wednesday afternoon. After opening the modest shoebox, I immediately proceeded to try them on. My initial concerns were that the shoe might not fit me. Lack of store demos had prevented me from actually TRYING before buying, and I found the Vibram sizing chart to be slightly confusing. The chart uses it’s own sizing system based on the actual length of your longest foot in inches. I went for a size slightly larger than my foot (by maybe 1/4 of an inch) just to be safe. At first when I tried on the shoe/slipper/glove it felt a little loose on my foot, but my toes DID reach well into the foot sockets and for the most part the KSOs hugged my foot comfortably. Comfortable is a great word to describe these things, because they feel fantastic. The fabric breathes and allows air to flow through, and it’s very snug around your foot. The slippers were a bit stiff at first but after working them in a little I found they bend and flex quite naturally with the contours of my foot. I have no complaints about how they feel, they feel great! My first jog in my Vibrams was an interesting one. You literally feel EVERYTHING in these things. When you hit a twig, you KNOW you just stepped on a twig. When you hit a significantly sized rock, the FiveFinger rubber sole bends over the rock and you can feel it’s shape pressing into your foot. 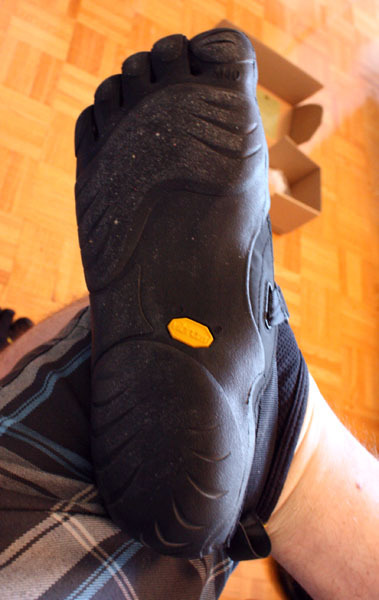 It’s a really neat experience for those who are used to heavily padded running/walking shoes. You kind of get a sense of natural freedom. Due to the mesh fabric and thin lining, air flows freely over your feet and you can feel hot and cold instantly… exhilarating! 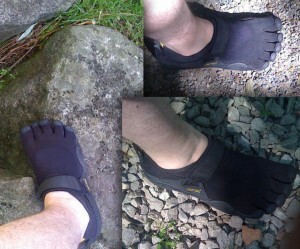 During my test-drive I took the vibrams over all types of terrain, grass, dirt, pavement, pebbles, large rocks, etc. The result was pleasing. I found I had much more control since the human foot seems to do a great job gripping, bending, and moulding to any form of earth. 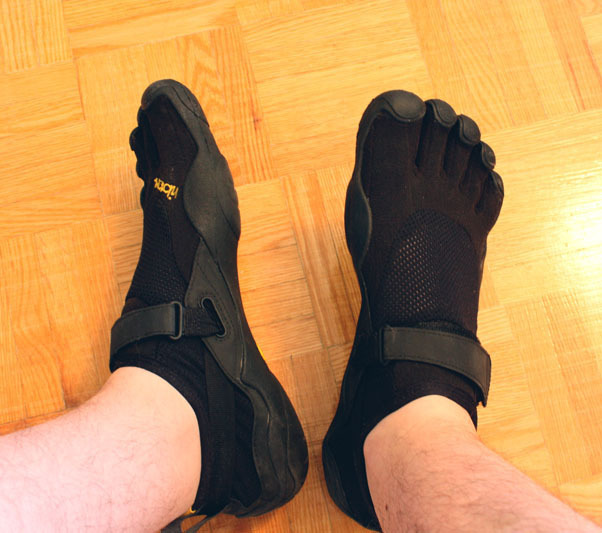 It is said that actual jogging and running in Vibrams can be difficult at first if you are conditioned to use running shoes since you use very different muscle groups. I made conscious effort to strike the ground with the palm of my foot and let my heel down last. This way, my foot palm acts as a sort of shock absorber, letting my heel down easy, versus the more destructive rolling heel impact I was warned about online. I found it fairly easy to adapt to barefoot activity, but I did notice my muscles get tired and sore fast so I’ve been taking it easy. I think that being an active Capoerista has significantly strengthened my muscles involved in barefoot exercise enough to make it a relatively painless and simple transition for me. I have to say that martial arts is incredible in Vibrams. While, usually, it is best for a Capoerista to ACTUALLY go barefoot so that their feet become tough to withstand outdoor Capoeira, I found that the KSOs do give me a much stronger grip and keep my feet clean from dirt and other nasty things that may be lurking outdoors. Taking the shoes out for a walk to the drug store was equally comfortable. I noticed my right foot was cramping up which was a little painful, but I’m not sure I’d blame this on the shoe, probably more so my feet getting used to barefoot walking. Feeling all the cracks and bumps in the concrete is really cool and definitely makes walking more interesting. In conclusion I highly recommend Vibrams. Although I was initially concerned about their fit, they ended up fitting like a glove (pun intended) in all aspects of my active life (so far). I enjoy the new tactile sensations of feeling the ground and wind over my feet like never before. My feet feel stronger, flexible, and more dexterous, and I feel that my KSOs have helped improve my Capoeira training in this way. I haven’t had a lot of issues with pain, and long term effects have yet to be observed but I’m optimistic. A lot of people have been naturally curious about my strange foot gloves, some have poked fun, others have asked where to buy them, and strangers sometimes stare, but for the most part people don’t really notice unless you bring attention to them. I’ll definately be getting a lot of use out of these things and I’ll keep you guys updated on future developments. I urge you all to give them a try! I agree – very insightful. They look cool. I’ve had the same pair of KSO’s for a year. You got to wash these bad boys regullarly. The odor is BAAAD. but I love ’em.